Please Note: The OwyheeStar News Blog is published on a daily basis. It is found at a different location (URL). We create it in Wordpress. At the top of the page, you will find this website has another information blog. Here you will find an occasional topical post. We hope you will subscribe to the Wordpress, and follow us. Please also check out the link at the topic of this page. OwyheeStar (pronounced Oh - Y - He - Star) is located on a small farm in far Eastern Oregon. (They are situated directly south of Ontario, Oregon (in Malheur County). This means they find their property tucked against the Idaho border. (The Snake River forms the border between Idaho and Oregon (except in one small area known as Big Bend). The south end of the property is about a long stone throw from the Snake River. 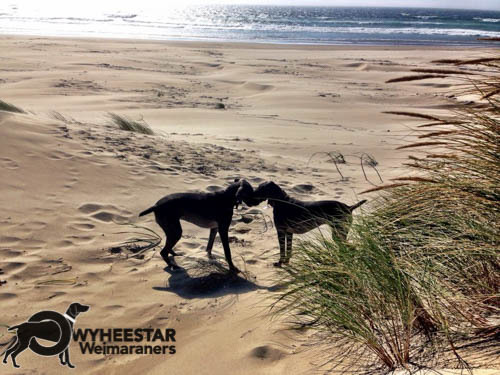 OwyheeStar is owned and operated by Cliff and Shela Nielsen. They have resided on the family farm for most of their lives. For Cliff, this amounts to 60-plus years. Cliff grew up on this farm; his family moved there just prior to his first birthday. Once he and Shela were married (in 1969), they we able to build a home on a corner of the property. The Nielsen farm is a small working hobby farm, but makes a perfect place for them to live, raise beloved Weimaraner, and to train the Weimaraner. On the south east end of their land, you will find an unfarmed area designated for bird-cover, and also used for a training ground. Near the middle of the farm, there is a small seasonal farm pond used for swimming pups, and training the Weimaraner. The land is prime row-crop, however; Cliff grows mostly hay. This gives him a place to run the Weimaraner. Childhood Memories are not soon forgotten! Cliff's love affair with the Weimaraner goes back more than fifty years. 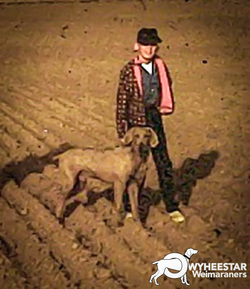 This love first took root when uncle Clifton raised a litter of Weims (near Othello, WA) during the l950's. Being a good uncle, he gifted Cliff with his first Weimaraner--Doc. Here we see a photo of Cliff and Doc. It was many years later when Cliff and Shela acquired their first Weimaraner. They were both found their hearts captivated by the breed. There was no turning back. After having raised the Labrador for most of their married life, they soon found room only for the Weimaraner. It is easy to see the Weimaraner soon took over their heart, soul, and home. Since then, they have had the privilege of knowing more than a few Weimaraner. Living with, and working with them is their joy. They count it an honor to share this love (and some of the pups they raise) with a few special persons. Cliff hunt trains for himself and a few other clients. He is actively involved in two International hunt clubs. This includes the Versatile Hunting Dog Federation (VHDF) as well as the North American Versatile Hunting Dog Association (NAVHDA). Of course, he is also a member of the Treasure Valley NAVHDA group, and the Snake River Versatile Hunting Dog Club. In addition, he has participated a few American Kennel Club hunt tests. The Weimaraner attracts a lot of attention. They are sleek, elegant, and a mystical dog. Originally, they were bred to hunt big game in Germany. As big game hunting declined, they (like many other European hunting companions) moved to other smaller game--birds and small fur animals. Today they are prized for their versatile ability to hunt upland game birds, and waterfowl. The Weimaraner has webbed toes. They are strong swimmers. carrying their body high out of the water. Check out these photos on our Water work page--click here! 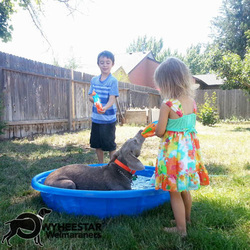 Weimaraners can be spotted in any number of places, doing countless types of activities. The beach is a popular venue. There are many other places to spot the Weimaraner, including at one of the many Northwest dog parks. Most are known to accompany the family on vacation, or for weekend camping trips. Some will seen accompanying runners--long and short distances. Many hunters opt for the versatile Weimaraner; therefore, the can be spotted in the field hunting. The Weimaraner by nature is a Velcro-type dog due to their propensity toward separation-anxiety. They are never happier than with you! The Weimaraner is a family dog. It loves its home and its humans. Puppy-biting is often bane of new puppy owners, as well as a problem for those with active young children. The Weimaraner will feed off of their energy, and at times this can be a bad thing. Regardless, more often than not, the children become close with their beloved Weimaraner. Many sleep together, play together, and create memories that last a lifetime.